There’s no doubt about it, this iOS update is one of the largest in Apple’s history. In the wake of the iPhone 5 launch, there was a considerable amount of criticism that iOS’ visual design was beginning to get stale. The core of the interface hadn’t really changed in either visual appearance or function. With iOS 7, those pundits get their wishes granted, as almost every part of the OS gets some kind of change. The new UI is a dramatic reimagining of the core of Apple’s mobile operating system for iPhones, iPod Touches, and iPads. The most obvious superficial change is a completely new visual appearance with a new emphasis on minimalism and simplicity. At the same time, iOS 7 is always in motion, with transitions and other effects almost everywhere you look in the OS. It’s a change that’s bound to be jarring and solicit mixed reactions initially like all redesigns are, but our thoughts have solidified since running the earliest betas up until the latest GM. Apple’s designers were no doubt faced with a huge challenge with iOS 7. The platform has to remain familiar enough to be immediately usable and recognizable to iOS 6 and prior users, while at the same time accomplishing the goals of both modernization and cleaning up the cruft that has accumulated in some places over the past 6 major versions. The other reality is that smartphone users no longer need a UI that emulates real-world analogues to real objects for them to be able to discover and learn the interface. Things like controls (switches, sliders, and buttons) that emulated actual buttons no longer have to appear that way to be immediately obvious. Textures and other surfaces no longer need to mimic the real world either. Instead these can now give way to something that’s minimalist and new. The educational phase is over, and for the most part smartphones are now largely mainstream rather than an enthusiast novelty or niche market. iOS 7 is the result of all that change. There are some obvious changes that stick out immediately, like app icons that are now a slightly larger size, a status bar area that’s now smaller and more customizable for developers, mandatory retina quality assets, new folder appearance, borderless buttons everywhere, different fonts (Helvetica Neue) and dynamic size, and a host of other first party changes. There’s really no way to avoid it, but iOS 7 moves to a completely different color palette than other releases. If there’s one thing that sticks out at me, it’s that the iPhone 5c really is the canonical correct device for iOS 7, as those devices essentially define the emphasis on color that’s visible throughout the whole OS. Each application gets a tint color that carries through it – ideally this color is used in the application icon in a very obvious way, then throughout the application to indicate interactivity. Calculator has orange function buttons on the icon, inside these buttons are still orange. Notes has a yellow strip like a notepad, inside the icon tint is yellow. Calendar has the date written in red, inside almost all the elements are red. Camera has a tiny yellow dot for the camera flash or LED AF assist, inside all the text and interactive elements are yellow. Without the shiny rounded buttons or sunken indicators everywhere, this tint color is really the only good way to know whether a certain element is actionable, and it’s a big theme in iOS 7. Heading into iOS 7 there was a lot of discussion about how computer interfaces were largely going “flat.” To many, that meant completely devoid of any sense of depth or z-height, to others that meant elimination of the kind of rounded, 3D buttons that previously cued users on what elements were actionable or not. While I’ll leave the discussion about what “flat” really means to human computer interface scientists, the reality is that iOS 7 isn’t really flat, and one of the most obvious places you can see that is with its use of translucency and parallax. Translucency is a big deal in iOS 7 for two reasons. First, it’s part of the “constant motion” theme of the design, for example while scrolling a page in safari or a dialog in messages you’ll see content move behind frosted glass elements. Second it gives hierarchy cues without being obvious about it or wasting space on drop shadows. There’s a certain depth that comes with the transparent effect that makes things understandable, especially for things like the notification center and control center shades. This allows certain views to be separate in an obvious kind of way. Alerts used to be one of the last bastions of Apple’s prior love of big rounded faux–3D elements, and now are translucent. Apps also now are supposed to draw the entire view all the time, even when the keyboard is up, as it now is transparent as well. I was a huge fan of transparency in Windows with aero glass, iOS 7 pulls off translucency and this frosted glass appearance very well, with just the right amount of opacity. There’s certainly a part of it that’s eye candy, but it does make a lot of sense in this “flat” world. The transparencies are great, but definitely computationally intensive on the GPU and obviously adds to an overdraw tax. As a result not every device that iOS 7 supports gets transparency and a blur effect, some devices just get transparency. On the iPhone side, the iPhone 4 lacks the cool blur effect in a number of places (notification center and control center are the most obvious), and iPad 3 does as well. iOS 7 moves to Helvetica Neue for the system font, with frequent use of the ultra light and light weights of that particular font. 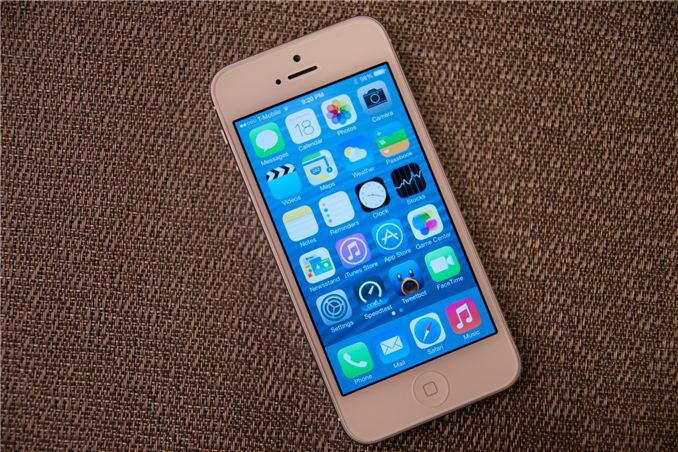 Apple is so proud of its change in fonts, it changed the “iPhone” font on the back of the iPhone 5s and 5c to match. It’s a not so subtle change, and iOS 7 also now places more emphasis on being typographically-centered. Much the same way that color is a theme that runs through iOS 7 applications, typography with a color tint applied is now supposed to define most of the user interface elements on their own. A new feature is dynamic type (through the new Text Kit set of UIKit classes), which essentially is an accessibility feature that enables users to change the font size bias system wide and in applications that use the UIFont method to get a font size. This automatically adjusts weight, character spacing (kerning) and line height, and seems like an awesome change for users who need larger font sizes for elements to be readable. One of my initial big concerns was the legibility of a number of iOS 7 UI elements based on what was shown at WWDC, such as the lock screen. Initially I saw stuff like light weight fonts on a light lock screen background and low contrast between font color and what was around it, stuff that any designer would never stop screaming about. To Apple’s credit, a lot (but not all) of these pain points have been addressed now that iOS 7 is ready for wide release, but a few could still pose readability issues outside of 20-somethings with good eyesight. Apple fixed a number of these elements by just moving to bigger weights, but I suspect there will inevitably be some additional adjustment and tweaking. The good news is that dynamic type makes it really easy to just change everything system wide or enable the bolder weight fonts through accessibility options, which moves font weights up one notch. iOS 7 brings motion to a whole new level, with a bunch of motion effects and gamification through both Sprite Kit and UiKit Dynamics. The short story is that these new frameworks allow developers to build applications with interactions that mimic real world physics, for example reacting to gravity or mass and user-input that triggers acceleration. The new UI in iOS 7 uses this framework throughout for things like spring loaded animations when opening apps or going into multitasking, dismissing tabs in safari, and so on. iOS 7 is very animation heavy, almost everywhere you go there’s either a subtle bounce-back (like on the passcode entry screen) or some transition. Applications float in when you go back to the home screen, notification center bounces accordingly depending on how fast you flick it down from the top of the screen, and applications zoom into or out of their icons when launched or closed respectively. It’s all a lot to look at, and iOS has always been home to design that wasn’t afraid to demonstrate how much stuff it could throw at OpenGL ES in the pursuit of making things look pretty without having FPS drops. The only issue is that after a while some animations start being a lot to sit through each time, especially the multitasking interface animations and app fly-in. Some of these issues have been offset by making the touch targets active while the notifications are playing, but I find that it’s still not enough – going back to the home screen the app targets work, as does multitasking, but you still have to physically sit through the animation, then the action happens. It’s disconcerting flicking apps up to dismiss them and having the UI stutter and play the slide animation after the action happens. One of my big use case is switching between messaging and the web quickly, and it just feels tedious waiting for things to happen while an animation plays. At some level animations clearly are masking loading times, and just like in OS X these will be removed slowly to make the platform feel faster, I just wish there was an option in the UI to speed things up. iOS 7 presents a fresh take on the system-wide UI, and has completely done away with the textured, gray app interface in use since iOS 1. UI elements in iOS 7 predominantly feature bold, basic colors mostly on a plain white background. Other background elements, such as those used for Spotlight, Control Center and Notification Center are varying shades of frosted gray, designed to adapt to the underlying wallpaper and user content. Iconography has also been simplified; a bit too excessively in some cases, but is applied uniformly across the OS. The in-app icons align with color scheme applied to the app (i.e yellow for Notes, red for Calendar and Music and blue for apps such as App Store, Phone and Messaging). A uniform set of icons provides for an extremely cohesive UI throughout the OS. The UI for selecting the date, setting alarms and selecting items from drop down menus in Safari is quite bland and could have looked better with borders or other supporting UI elements. In some cases, especially on the iPad, this leads to excessive white space. Apple has also introduced a new swipe gesture to efficiently navigate apps with hierarchical interfaces. Swiping right from the left edge of the screen takes users back to the previous screen, essentially acting as a back button. The gesture is especially useful in Safari and Messaging, allowing much faster navigation. Given the small display size of the even the flagship iPhones however, edge gestures are easy to activate inadvertently. Swipe to delete has also been reversed in iOS 7. Rather than a left to right swipe to bring up a delete button, it’s now a right to left swipe. The new system font, coupled with predominantly white colored backgrounds, use of transparent layers and a bouquet of bold colors applied throughout, have given iOS fresh and vibrant look, one which it desperately needed for some time now. The use of transparencies gives a sense of place within the OS, but also offers nearly infinite ways to keep the OS looking new, just by changing the wallpaper. At a high level, the lock screen on iOS 7 is immediately familiar looking. There’s still the time and date displayed in large characters up top, and slide to unlock at the bottom. The shortcuts that worked before in iOS 6 also still work here, you can launch the camera by pressing and holding on the camera icon at bottom right and dragging up, for example. What’s new is the addition of two new small rules which launch control center and notification center from the top and bottom. These quick access shades overlay themselves on the lock screen. Notifications that have come in while the device was locked still fill in underneath the time and date, and are actionable by sliding to the right just like they were before. Only the top notification is displayed at 100 percent opacity, the others are slightly greyed out but still visible, so you focus immediately on what’s newest. When a notification has popped in there’s also a transparency which appears behind it, making it easier to read the latest notification on top of your lock screen wallpaper. The top status bar is also enlarged relative to its appearance throughout the rest of iOS 7. Icons and font size are increased here ostensibly so they’re more glanceable. There’s no longer a huge battery icon visible when the iDevice is plugged in and charging either, so this larger status bar obviously takes the place of it. Turn by turn directions are still presented behind the lock screen while in use, now there’s less clutter in the way. Slide to unlock and the other shade and camera toggles remain, but are subtle in comparison. The lock screen really is a microcosm of the changes that are made to iOS 7. Functionally not a lot is changed, so the existing workflows still work, there’s just tweaks to the visual appearance. As have I (since the beta). I think initially when I updated I started playing around with it more, I had noticed a drop, but then as soon as I got back into my usual workflow, I noticed a signifant improvement in my battery life. So much so that I've had the phone last me 2 days of light to moderate usage multiple times now, something I haven't been able to do for a while. Battery life has been fine. Different betas have had different experiences. In your "General" Settings, there is something called "Background App Refresh", which will drain your battery if you have it enabled, especially depending on what apps you have it enabled for. @HisokaKoga, the fanboy exit door is that away. I was asking for a serious and objective comment because my battery went from 90% to 60% in an hour.